Water kettle. No need to get fancy. Boiling is boiling. Pourover cone and filters. A small cone & #4 filters for single or 2 cup brewing. Large cone and #6 filters for larger batches. 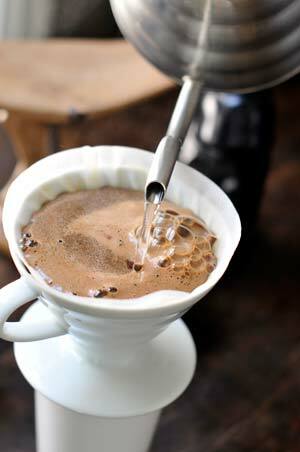 Hario V60 + Hario filters is a wonderful cone brewing option. Burr Grinder. Hario hand grinder is cheapest. Baratza burr grinder is the best for home use. Water is the essential and greatest volume element of your cup. Spring or filtered water will extract the best flavors from the coffee. Do not use distilled water. Heat the water to boiling and let it set for 30 seconds. This will result in water between 195-205 degrees F.
Grind the coffee in a burr grinder for proper brewing. This is the kind where the coffee goes into the top and is ground evenly between the burrs. 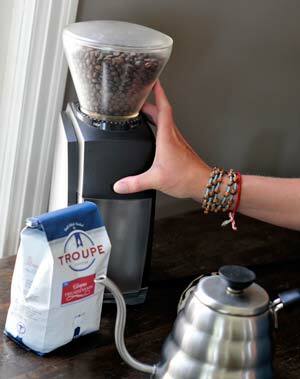 Set the grinder to either a little finer or courser than drip based on taste and brew time. Blade grinders will work, but often result in uneven grind size and thus, uneven extraction. If you use a blade grinder, counting in seconds the grind time will help you achieve more consistency and avoid overgrinding. If coffee is clumping on grinder walls before falling back into the middle it is too fine for hand brewing. Use 1-2 scoops of coffee or 24 grams per 8 oz. of water. We encourage you to experiment. Fold the seam on the filter flat and place it in the filter so it is smooth after you start the water boiling. Rinse the filter with a little boiling water. 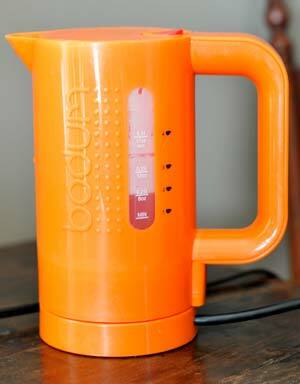 The warm water will heat the receptacle, allowing the coffee to retain heat. Empty the water out of the receptacle. Pour the coffee into the cone/filter. Pour aggressively into the middle of the grounds to mix all the coffee in initially. Wet all the grounds on the initial pour. The coffee will bloom and form a crust on top. After it begins to settle slightly, slowly add water to keep this crust elevated. Add the water in a circular motion while keeping the crust elevated. Once you have added all the water you intend to, let the water drip out. If you are not able to stretch the brewing to 2.5 minutes or so, consider brewing a slightly larger batch in the same cone or make sure your grind is not too course.